Make the best use of your budget to share your best ideas. 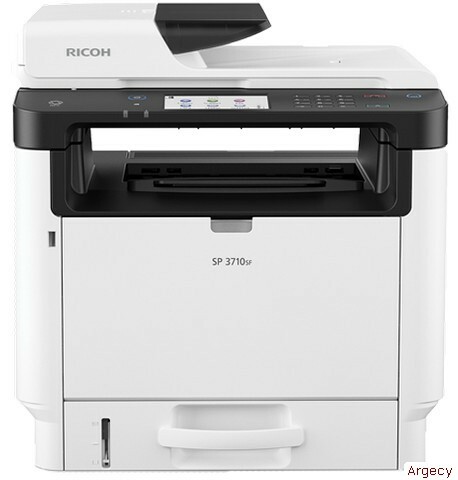 Use the low-cost, affordable RICOH SP 3710SF Black and White Laser Multifunction Printer (MFP) to print, copy, scan and fax with ease from the desktop. Embrace versatility with multiple connectivity options, add convenient remote printing, handle a wide range of media and reduce print costs with a high-yield print cartridge. Share messages quickly. Print black-and-white output at up to 34 pages per minute (ppm). Use the 35-Sheet Automatic Reversing Document Feeder to transform originals into one- or two-sided copies or into digital files that can be shared via Scan-to-Email/Folder/FTP and other options instantly. Use paperless faxing to reduce paper and transmission costs. Manage multiple projects simultaneously with a powerful controller and extensive memory. Use the large 4.3" color touchscreen to jump between tasks easily ? and find important job details, device settings and more ? with fingertip precision. Add watermarks, covers and more for a professional look. Use ID Card Copy to scan two-sided originals onto one side of a sheet of paper. Small office convenience comes hassle- and cable-free. Place the compact device on desktops, work stations and shelves with standard USB 2.0 and Ethernet interfaces. Or, opt for USB WiFi® 2.4GHz wireless connectivity and avoid cumbersome cords and cables that can clog workways and bog workflows. Use the automatic print driver tool to quickly download print drivers and simplify configurations. Work where you are, print when you want. Download the RICOH Smart Device Connector app to your iOS® or Android® smartphone or tablet and capture information from cloud storage applications. Simply touch your Android® device to the Near Field Communication (NFC) tag or scan the QR code on the panel for authentication. You can also print via Mopria? or Google Cloud Print?, or from your iOS® device via AirPrint®. Print up to 7,000 pages with the impressive, high-yield All-in-One print cartridge. Quickly restock paper via the convenient front-access design for long-lasting, maintenance-free output. Even your most novice users can replace the print cartridge in seconds without technical assistance. Use Web Image Monitor or @Remote to monitor the device. Get attention with compelling text and images at up to 1200 x 1200 dpi on a wide range of media, including sizes up to 8.5" x 14", thicker stocks and even envelopes. Load the standard 250-Sheet Paper Tray for everyday printing. Use the 50-Sheet Bypass Tray for unique sizes and stocks. Or, add an optional 250-Sheet Paper Tray to extend print runs. Reduce paper usage by up to half with default duplex printing. Use Sleep Mode to power down the device when it?s idle. Plus, the SP 3710DN is ENERGY STAR® certified, meets EPEAT® Silver criteria* and offers low Typical Electricity Consumption (TEC) value of 1.304 kWH/week. RICOH SmartDeviceConnector, AirPrint®, Mopria®, Google Cloud Print? Paper Sizes: 5.5" x 8.5" - 8.5" x 14"
This option allows you to connect wirelessly to the Local Area network (LAN).